Many pharmaceutical companies have been cautious about their social media presence. However, that’s no surprise given the advertising restrictions and potential minefields of discussing prescription medicine in an uncontrolled environment. This report looks at how 16 companies have embraced social media and the trends that have emerged in the industry over the last five years. 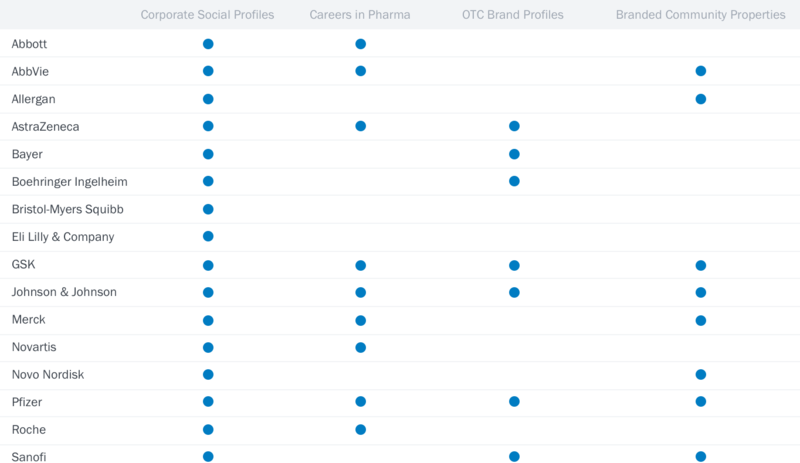 On Facebook, pharmaceutical companies saw growth from both Corporate pages and Career pages. The high growth of the Careers pages is perhaps an indicator of the low number of total Fans these pages have. As for the Corporate pages, the high growth rate suggests that this silo was a very important channel for pharma brands in 2016. On Twitter, pharmaceutical companies struggled to increase Follower growth throughout 2016. The Branded portals’ handles were the biggest drivers of Follower growth mostly due to the comparatively low number of Followers. Just like on Facebook, the OTC Brand handles didn’t register any significant growth. This could be due to companies refocusing their efforts in other silos. Where’s the Effort and Return? 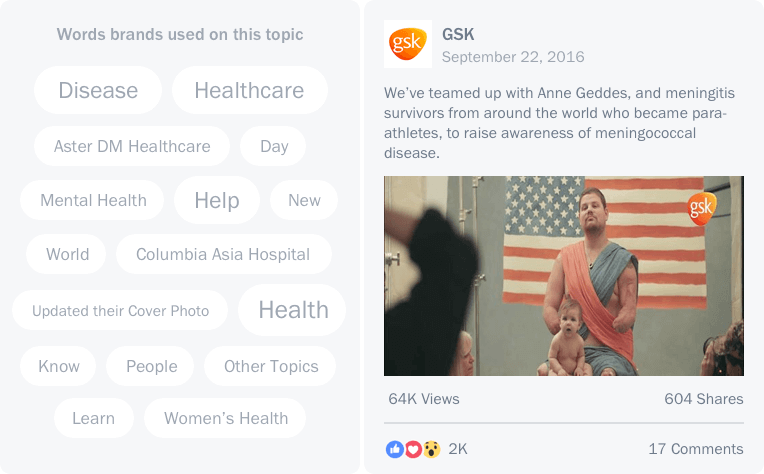 On Unmetric Discover, a searchable database of over 500,000,000 pieces of brand content, the following topics surfaced as the most popular talking points for pharmaceutical companies. GSK’s promoted post about meningococcal disease was the most shared healthcare-related post by the 16 pharmaceutical companies in this report. 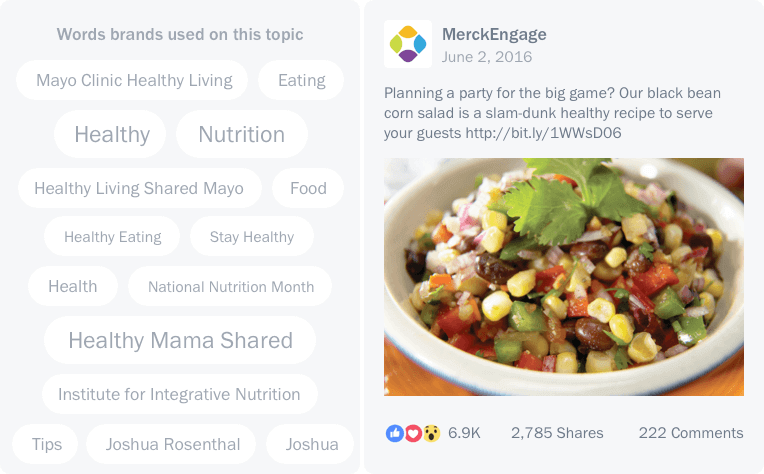 MerckEngage’s promoted post about a healthy recipe was the most shared nutrition-related post out of the 16 pharmaceutical companies included in this report. Across social networks, pharmaceutical companies have been publishing less social media content. 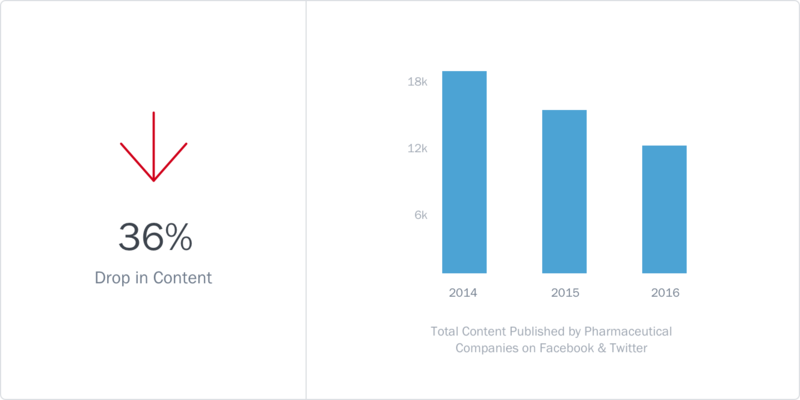 Since 2014, there has been a 36% drop in the amount of content published. 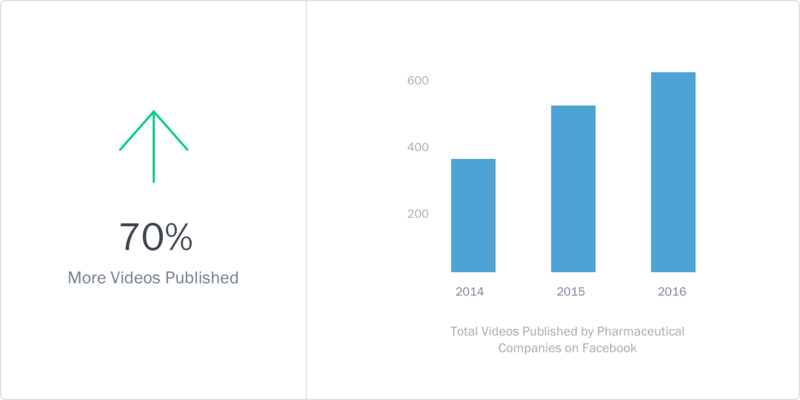 Videos now account for 16% of all content published by pharmaceutical companies on Facebook. This transition mirrors what is happening in other industries across Facebook, Twitter and Instagram. As brands compete for attention, videos provide the means to capture it. 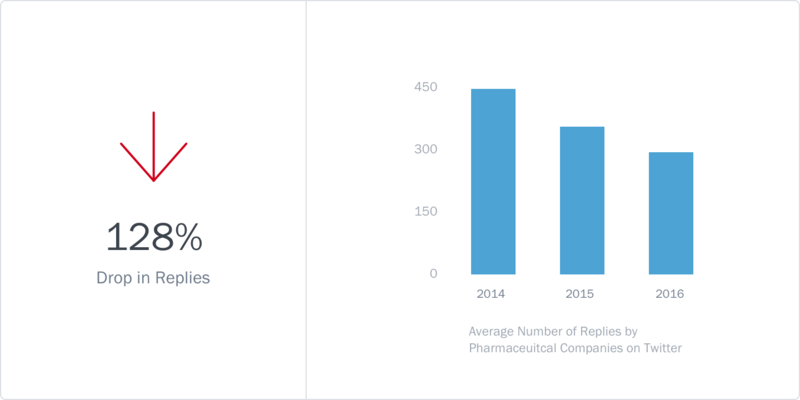 Though the volume of content published by pharma companies on Facebook has fallen year-on-year, the average interactions per post has been increasing. The biggest driver of this growth has been from Likes, which suggests paid promotion is largely responsible for the increase. Note – This analysis doesn’t include dark posts. Only publicly viewable posts were considered for the study. 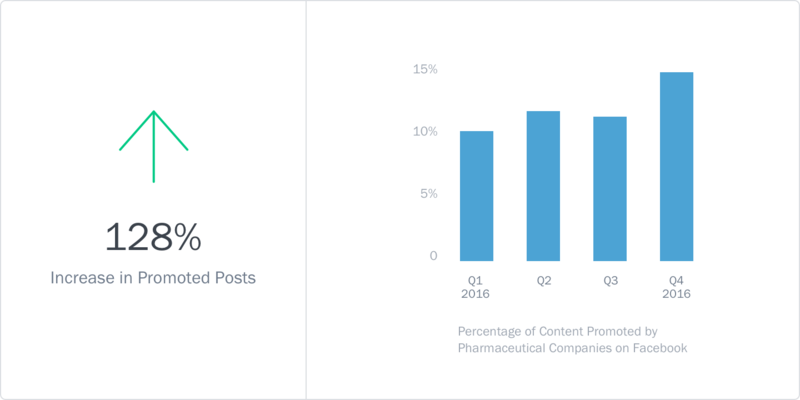 The percentage of Facebook posts being promoted by pharmaceutical companies increased from 10% to 14% from Q1 to Q4 in 2016. This, in addition to the rise in the number of videos being published, has helped the pharmaceutical industry generate higher engagement from fewer posts. In 2013 and 2014, pharmaceutical companies appeared to pin their hopes of a strong social media presence on OTC brands. However, in 2016, there was a steep decline in the amount of public content being produced by these profiles along with a similar drop in engagement. 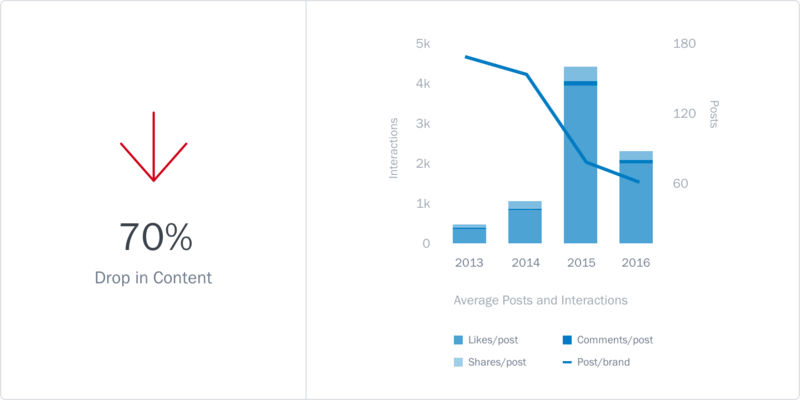 The decline in content could be due to the increase in ‘dark posts’ that brands can publish on Facebook. 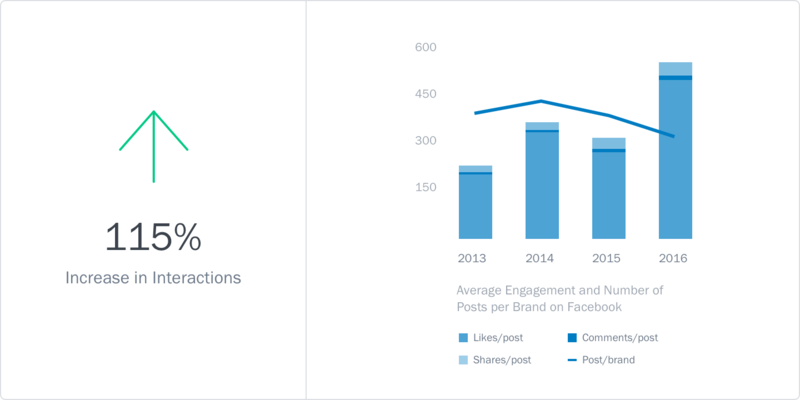 These posts do not appear on the brand’s Facebook page and were not considered for this analysis. Pharmaceutical companies appear to be more reluctant than ever to get involved in conversations on Twitter. The largest decline has come from the OTC brand handles where brands are now highly unlikely to reply to user tweets. 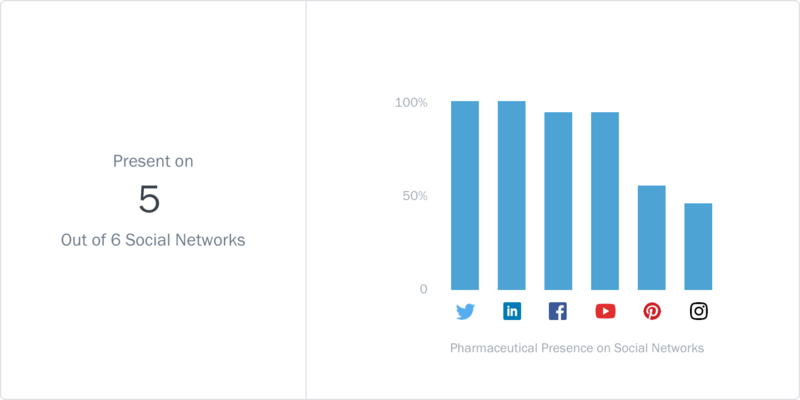 Pharmaceutical companies are active on five out of six social networks with the vast majority of companies preferring Twitter, LinkedIn, Facebook and YouTube. Twitter and LinkedIn are the most preferred social networks with a 100% presence. Only seven out of 16 companies have a presence on Instagram, making it the least preferred social network.